Many companies and businesses are discovering that used forklifts are more economical and a great investment for their budgets and daily operations. A well maintained used forklift can be a fraction of the price of a brand new forklift and perform the same operations. We would like to take the time to understand your work site, ask some questions about how you use the forklifts and give you all the necessary information to assist you in making the best possible decision for your needs today and into the future. Whatever your budget is we can help get the right forklift to fit your needs. Financing is also available to those who qualify. Chalk’s Industrial Equipment Sales, Inc. maintains a substantial inventory of used forklifts consisting of over 200 forklifts in all price ranges, including all major brands, types and sizes. 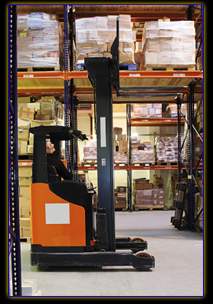 Our fleet includes forklifts from 2500 lbs. capacity to 30,000lbs capacity. Our qualified forklift technicians inspect, provide repair and perform maintenance service for every piece of equipment before we sell it to you. That is why every forklift is backed by a 30 day warranty on the complete forklift. Being in business for more than 20 years has allowed us to develop a network of resources for buying used forklifts and material handling equipment. Our buying power makes it possible for us to sell our customers well maintained used equipment at fair prices. Thank you for choosing Chalk’s Industrial Equipment Sales, Inc. for your forklift needs. Our Professional technicians are always available to answer any questions that you may have. Check out our In-Stock Inventory page, our stock changes often, so feel free to check back for new forklift additions. Please click on the Request an Estimate button below to fill out an online form to receive pricing or for further assistance. After submission, a used forklift sales representative will contact you during our regular business hours. You can also choose to call us at 410- 686-6800, or stop by our shop. Thank you for doing business with Chalk’s Industrial Equipment Sales, Inc. in Baltimore, Maryland! We carry the following quality brands of forklifts: Taylor, Hoist, Doosan, Daewoo, Barrett, Big Joe, Blue Giant, Caterpillar, Clark, Crown, Cushman, Hydro-Lectric, Hyster, Komatsu, Linde/Baker, Mitsubishi, Mercury/ Pettibone, Namco, Nissan, Prime Mover, Raymond, Schaeff, Talor-Dunn, TCM, Toyota, Used Air Tire, Used Diesel, Used Electric, Used Gas, Used Propane, Used Sit- Down Electric, Used Stand-Up, Used Warehouse, White, and Yale.